What kind of ridiculous name is “Flapjack”? My first memories were of wandering the Sierra foothills, a puppy lost and alone with no idea how I got there. I had a collar with a tag which simply read “Jack”. I made friends with all sorts of animals, including a very gregarious duck. I wanted to fly like him and studied the way he flapped his wings to defy gravity. I had ample ears and figured I could utilize them as wings. As I ran madly through the forest with my ears flapping in the wind, my friends cheered me on..”flap – Jack”..but needless to say, gravity was not even remotely challenged, much less defied. So I was resigned to a grounded life and a new and improved name. OK, the name is a bit ridiculous and lacking in nobility, but it suits me. Eventually I found a home with a well meaning but somewhat clueless couple, and I dedicated my existence to helping them enjoy life in spite of themselves. In furtherance of that endeavor, I started this dog blog as an example to them that anything is possible. 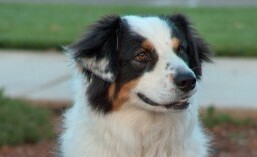 This entry was tagged aussie, australian shepherd, blog, dog, flapjack, humor, names, what's in a name. Bookmark the permalink.